We already knew that Facebook engagement can drive website traffic, and now that Facebook is functioning as a search engine for local businesses, it’s become even more important. Before we go on our first date, let’s talk about normality. 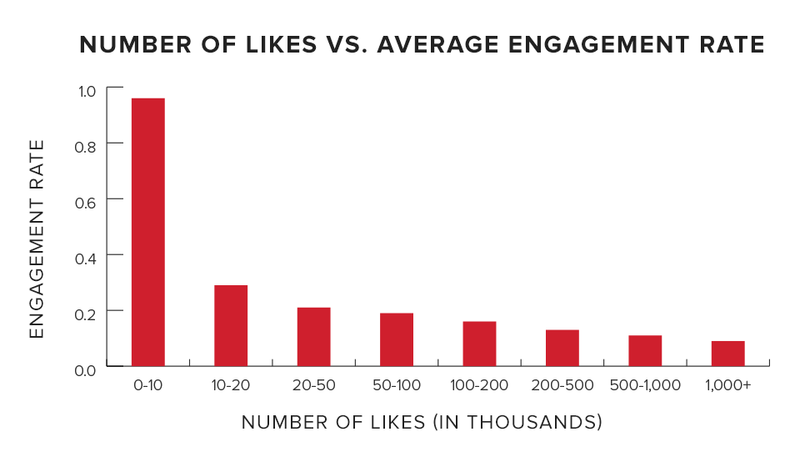 What’s normal when it comes to Facebook engagement? Well, if you monitor your engagement rates, you probably notice they fluctuate a lot. That’s normal, but wouldn’t it be better if your numbers improved? So, how do your numbers stack up? Not sure how to find your engagement rate? Use this engagement calculator to see the engagement rate for your posts. Are You Courting Your Facebook Followers? You don’t have to be a knight in shining armor, but you should show your followers a little chivalry. There are dating rules we should follow if we want a second date (or more engagement). What kind of personality are you putting out into the world? When you go on a date with someone interesting who has a good personality, makes you laugh and discusses interesting topics, you want to tell the world. So, does your content have personality? Are you posting shareable, relevant, quality content on Facebook? Host a contest. It doesn’t have to be extravagant, but like showing up to a date with flowers and chocolate, it can work wonders to boost Facebook engagement rates. There are a few lessons we can learn from this contest. It was easy to enter and focused on something the company knows its customers get excited about. The prize was a small item, just one t-shirt. 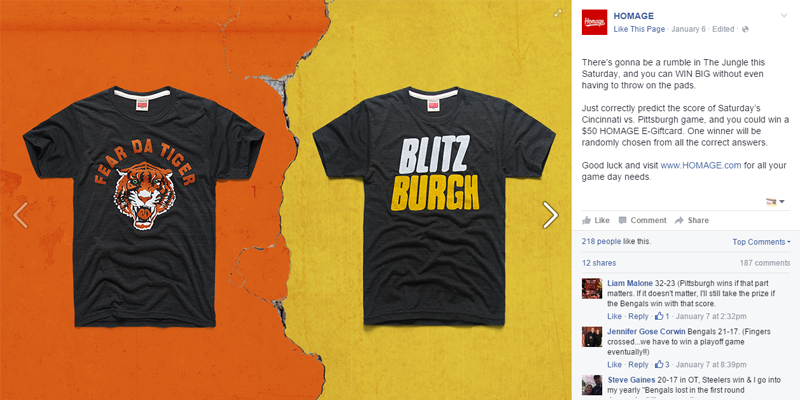 It also contained a link to the company’s online store, promoting other NFL gear. If we take anything away from this, it should be to keep it simple and customer-focused. Don’t have anything to give away? That’s fine. You can always offer a discount if your page or a certain post gets a specific number of likes or shares. And remember — like dating, Facebook has some rules. Always follow the promotion guidelines. If Facebook shut down your contest before you could award prizes, your followers would not be happy, which would likely lead to lower engagement rates. Ask a simple, yes or no, question. What’s easier than typing a quick ‘yes’ or ‘no’? These might sound a little cheesy, but you never know until you ask. While you wouldn’t break out the wallet pics on a first date, a Facebook photo really is worth 1,000 words (or at least an 87 percent interaction rate). So post a picture and follow it with a question. Get trendy with it. Throwback Thursday and Flashback Friday are great ways to connect with followers if you have older pictures of your business. Is your business too young for #tbt and #fbf? Post what’s relevant to your brand. Restaurant owners can post photos of food or menus. For retail stores, it could be new displays or seasonal decorations. Salons and spas can post photos of clients before and after treatments or photos of spa menus. Keep in mind that photos can be tricky. As well as posting what’s relevant, there are a few other rules you should follow. Make sure images are high resolution. Keep captions short. If the image contains a call to action, make sure it is clear and concise. Here’s some more information for sizing and posting a wide variety of photos on Facebook. You know that aunt who is always wanting to set you up with someone? Let her! Reviews and recommendations are great ways to boost sales. According to The Journal of Business & Economics Research, 59 percent of 249 social media users surveyed used Facebook recommendations to purchase items. Ask followers to post and share their reviews. If you want to see more engagement from your followers, you need to be engaged. It might seem like common sense, and if you’ve ever been on the active end of a one-sided text messaging conversation, you know what I mean here. Reply to your customers’ messages and comments. A large percentage of messages on social media never get answered, and that’s just bad customer service. Remember, Facebook marketing is a long-term commitment, not a fling. Many business owners focus on going viral when they should be focusing on the long game. Get that second date, keep building those relationships, and just remember that not every date goes well. Not every Facebook post is going to get thousands of likes, but if you use these strategies for posting, you should see a definite improvement in engagement. Need help with your business's social media? Our new social media plan can help! You can learn about what the plan has to offer in our previous blog. Thanks for the great advice...now to put it into practice! Hi Isabella! What a wonderful article. I loved how you used relationships to explain your thoughts. I do agree that Facebook is becoming the search engine for local businesses, we any business for that matter, and that businesses must be able to engage and connect with their market/followers in order to maximize their full potential in social. Social media is the best way to get your business out there, but you must be in it for the long haul and not just for temporary success.